Welcome to this report on my photo highlights from 2014. It contains samples of photos that I took during 2014. I’ve been writing annual reports on my life since 1999. This is a powerful reflection process. It helps me understand what I did to obtain the results that I achieved. And, of course, it helps me compile a biography. Note: I added links to articles, organizations, and other info at the bottom. 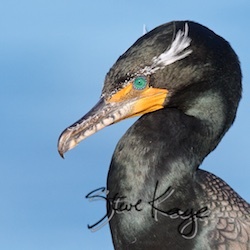 The bird in the photo is a Double-crested Cormorant in breeding plumage. My total photo count for 2014 was 122,610. The answer is simple: Practice. And I think I’m improving. I bought attendance at a 4-day IPT (Instructional Personal Training) with Arthur Morris in January. 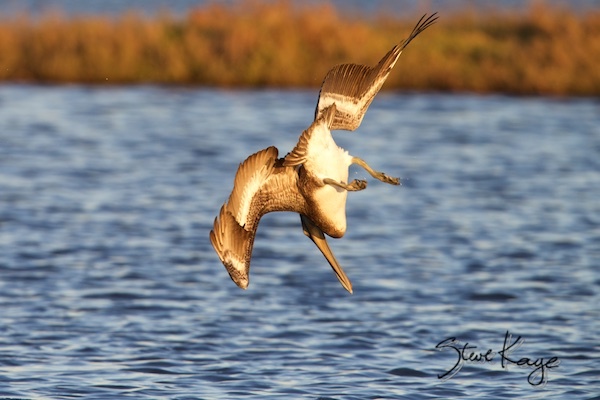 This provided an opportunity to spend time with six exceptional photographers, touring the best birding spots in the San Diego area. I like this photo because of the background provided by the dark sea with patches of foam. We spent mornings on the rock near the Cave Store in La Jolla, CA. So these two photos were taken from above the birds. 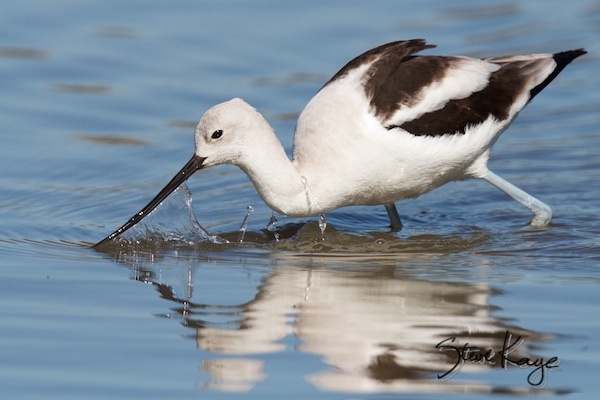 American Avocets search for food by sweeping their bill back and forth. Here’s a photo that captured the wave of water following a sweep. And yes, it’s difficult to take such a photo because these birds move quickly and randomly. The Western Bluebird is one of my favorite birds. Here’s a female that has just plucked a Toyon Berry. Yum. 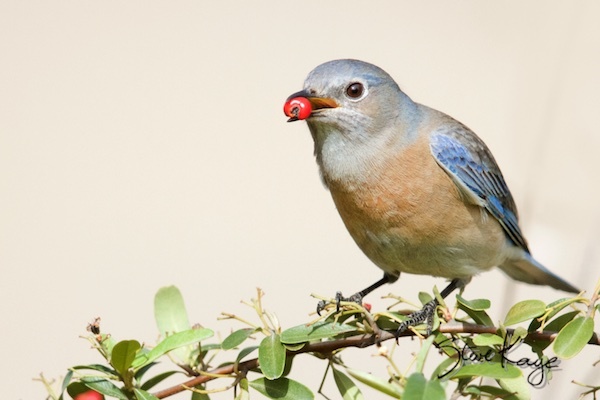 If you want to attract birds to your yard, create a bird-friendly environment for them. This includes avoiding the use of toxic chemicals, such as herbicides and pesticides, because these chemicals poison birds. And, of course, it includes growing plants that produce food birds eat. 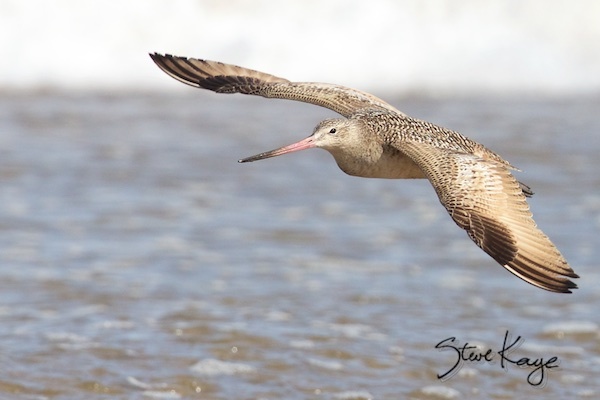 Marbled Godwits, Whimbrels, Long-billed Curlews, and other shorebirds can be easily found in the Morro Bay, CA, area because most of this area has been left as wilderness. 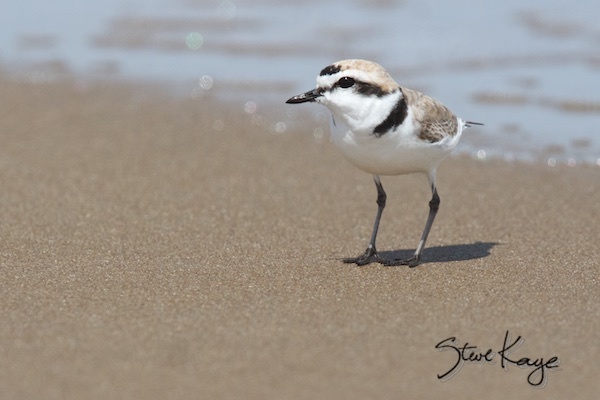 The Western Snowy Plover is an endangered species. 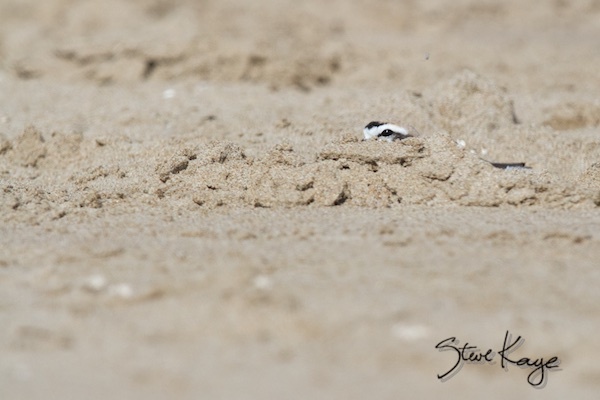 This small bird is a joy to watch as it runs back and forth on the sand. It’s incredible that this bird survives. They lay their eggs in a depression in the sand. 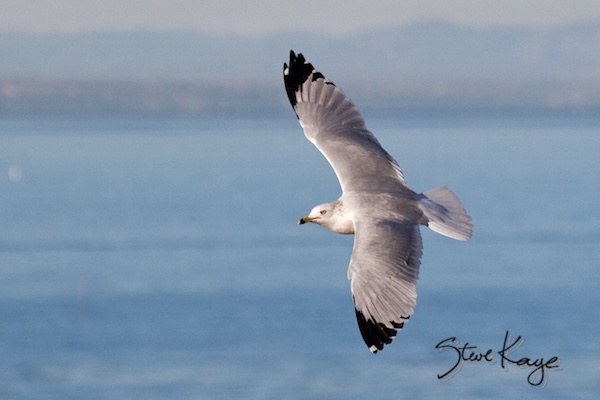 So they’re vulnerable to every predator that eats small critters, which includes gulls, hawks, foxes, crows, and so on. Fortunately, their colors blend in with the sand. This should be easy because I chose a photo where the eye is obvious. Imagine that you’re 100 feet (30 meters) away looking across miles of sand. Then it’s a challenge. Birds spend most of their free time tending to their feathers. 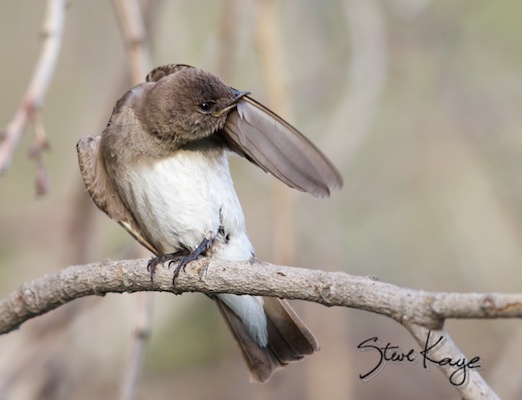 Here’s a photo of a Northern Rough-winged Swallow repairing a primary wing feather. There’s an important lesson here: If you spend enough time outdoors, you will encounter some truly memorable scenes. I bought the Canon 1Dx in March. This camera made a major difference in my photography. With it, I was able to capture images that I missed with other cameras. The focusing speed and sharpness are extraordinary. Now I know why the best pros use the best equipment. The best way to see new birds is to go to a new area. Then it helps to talk to the experts who live there. 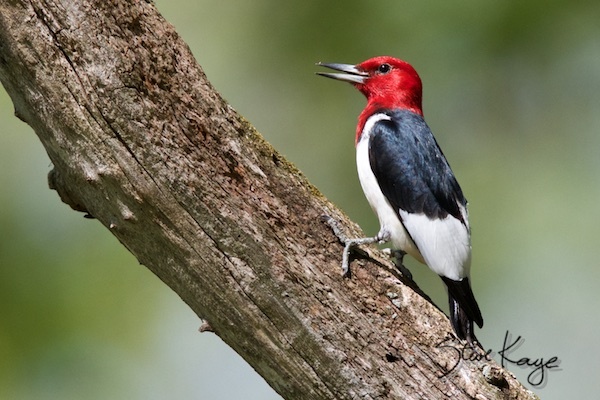 The director of Lincoln Memorial Garden, Springfield, IL, told me that Red-headed Woodpeckers could be found in the area. So I looked. And two days later I found them in a grove of trees on the other side of the road from this garden. There’s another point here. Even with expert help, it still takes effort to obtain results. Don’t enter a song contest against this bird. First, it’s a mimic. So it can imitate the song you just finished singing. And second, it has two independent voice channels. So it can sing two different songs at the same time. 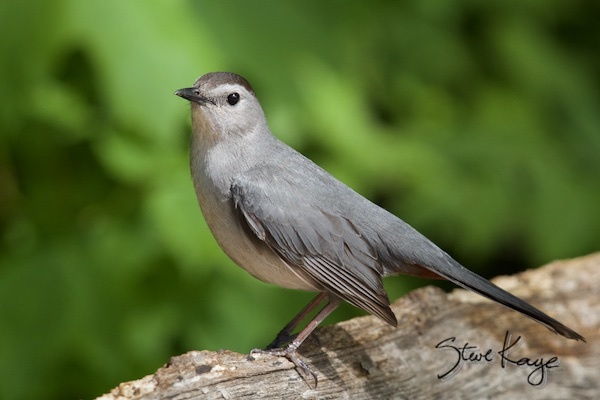 It named a Gray Catbird because its primary call sounds like a cat meowing. 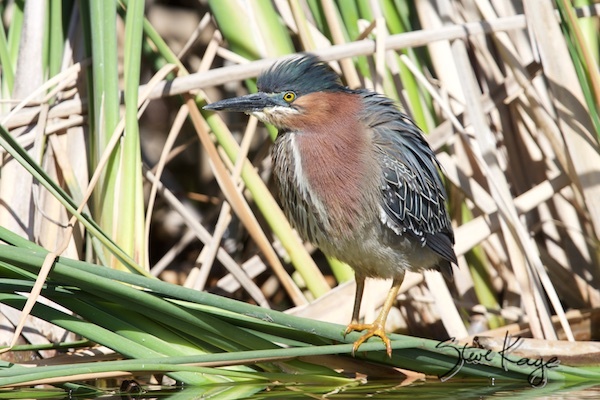 This Green Heron (with the help of a friend) built a nest in the reeds shown in the background. For days he flew back and forth bringing sticks, which she (the friend) assembled into a nest. Hauling building materials is hard work. So here he is, fluffing up his feathers, taking a break. This small bird is pondering a recent name change. It used to be called a Nutmeg Mannikin. And in pet stores it has been sold as a Spice Finch, Nutmeg Finch, and SKU #473912. 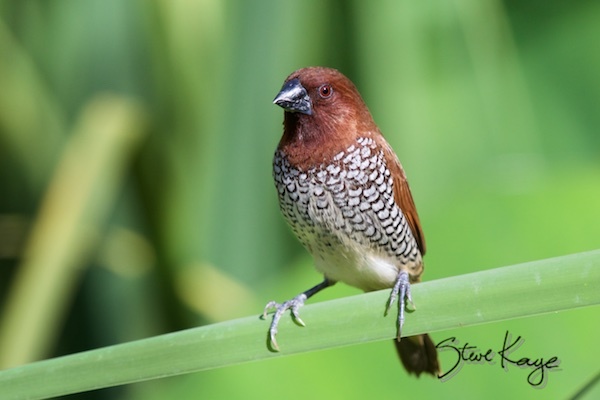 Now, thanks to a committee, this bird is called a Scaly-breasted Munia. Actually, this bird doesn’t care what people call it. That’s just the noise people make in their minds. All this bird wants is a place to live. I found a group of flowers in the Fullerton Arboretum that attracted hummingbirds. So I spent more than a dozen mornings taking photos at that location. Fortunately, I could stand in the shade of a tall cactus where it was comfortably cool during the hot summer mornings. This bird wants food and it wants it now. 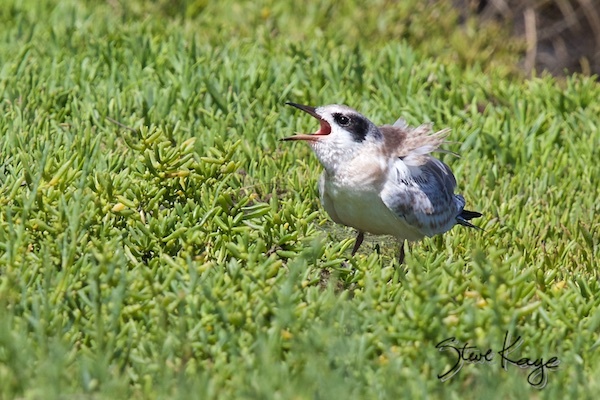 Here’s a juvenile Forster’s Tern calling at the Bolsa Chica Ecological Reserve in Huntington Beach, CA. This story started in May with a small ad placed in a bird magazine. Intrigued, I checked their web site. And then I phoned. And I phoned again. 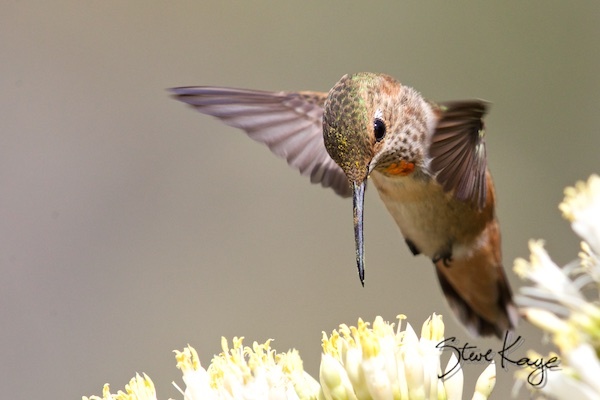 A week later, Ross, who founded The Hummingbird Society, called to ask if I’d speak about taking photos of hummingbirds at the 2015 Hummingbird Festival. 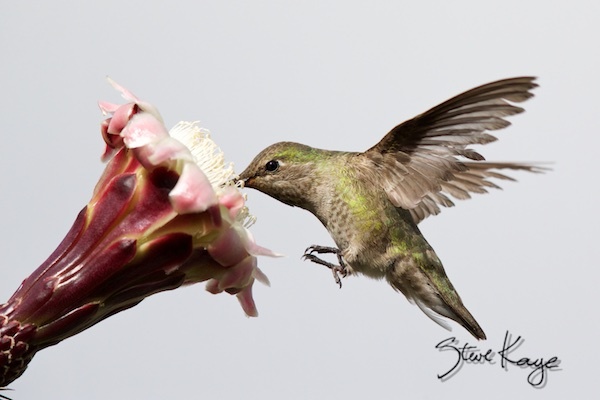 So, I traveled to Sedona, AZ, to attend the 2014 Hummingbird Festival and to take photos of Hummingbirds. I suspect hummingbirds cause magic. For example, I stopped by the office for the Hummingbird Society as soon as I arrived. 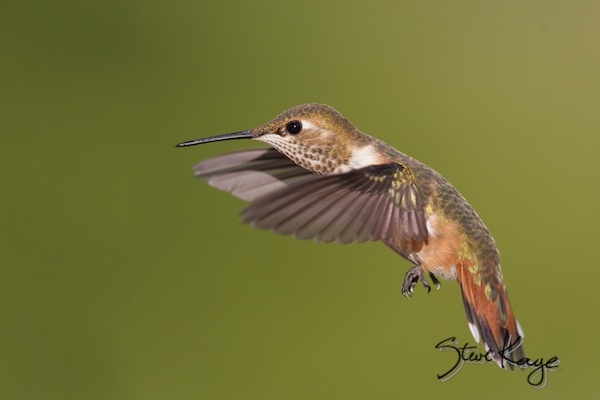 While there, I asked if anyone knew where I could take photos of hummingbirds. A woman, who was visiting the office, heard my request and offered to let me take photos in her back yard. Her yard had over a dozen feeders with hundreds of hummingbirds. So, over the next two weeks, I visited her yard ten times and took over 9,000 photos. Since then I’ve been working on a talk that shows everyone – from beginner to expert, with cameras both large and small -how to take photos of hummingbirds. I expect to have this talk ready by late April of 2015. Then I’ll be seeking groups that want to host this presentation. Please call if you’re interested. Most likely you’ll hear this bird’s distinctive chatter rather than see it. 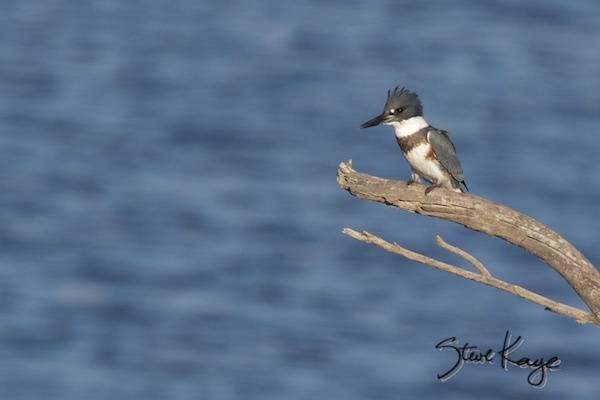 A Belted Kingfisher is shy and thus it leaves as soon as anyone approaches. The male in this species is less colorful than the female. She has an extra band on her chest. Every article about birds must have at least one photo of a hawk. 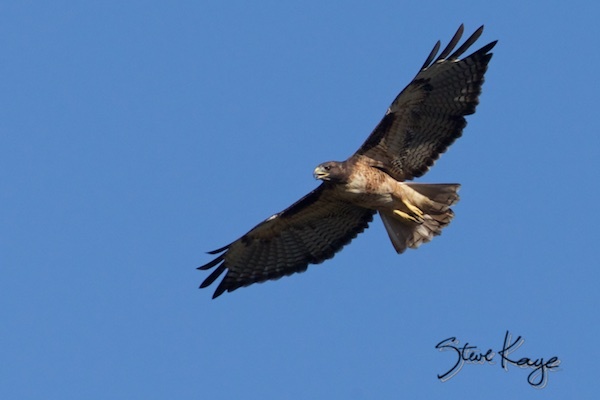 This Red-tailed Hawk was flying over the Fullerton Arboretum one morning. 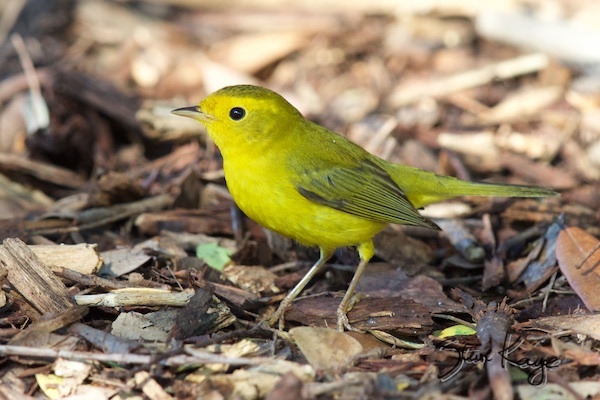 It’s fall and warblers are arriving in Southern California to spend the winter. I like female birds because their colors convey a subtle beauty. The male has a shiny black cap and bright yellow feathers. 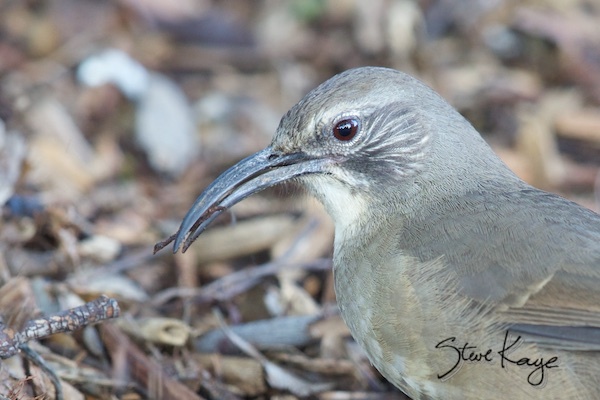 The California Thrasher uses its bill to dig through ground cover in search for grubs. I took a video that is now part of my talk about birds. It’s fascinating to watch this bird tear the ground apart. By the way, notice the feather detail in this photo. 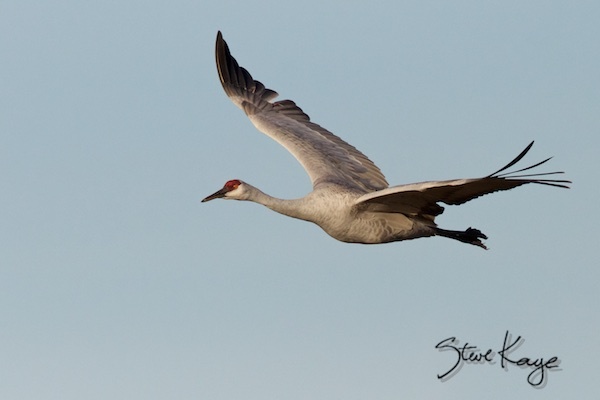 Sandhill Cranes migrate south to Bosque del Apache for the winter. I wish I could spend months watching and taking photos of these magnificent birds. 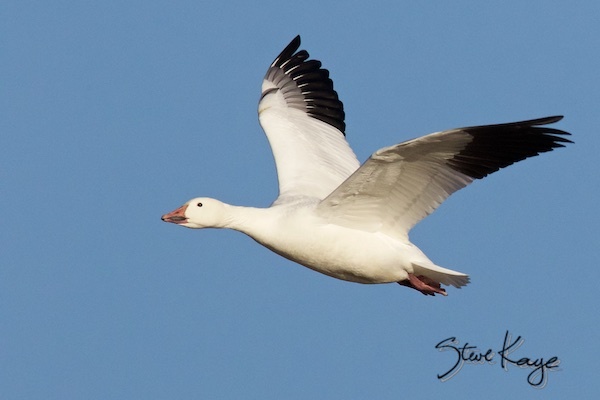 Thousands of Snow Geese also migrate to Bosque del Apache. It’s breath taking to watch them take off. Then the sky is filled with white, honking birds. Notice that both of these birds were photographed without showing shadows on their wings. That requires being in the right place at the right time. I’m keeping a list of the birds that I’ve seen. This was a good year in that I added 38 birds to my list. 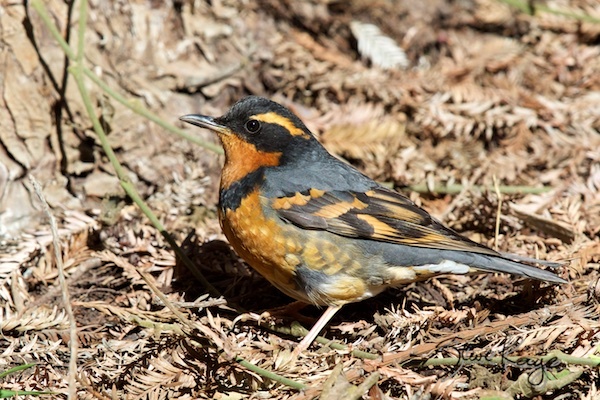 The Varied Thrush, seen at the Fullerton Arboretum, was one of them. This bird follows a schedule. Five days in a row, it arrived at this tree at 9:40 AM. So for a week, I had an appointment with a bird. Then the bird changed its plans, arriving at 10:40 AM. And then it missed two days on a weekend. 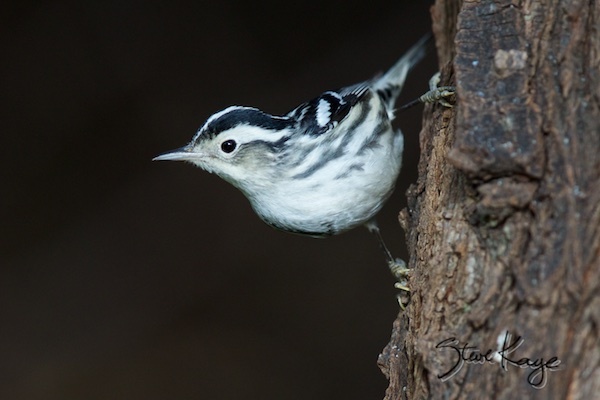 Black-and-white Warblers act like nuthatches. They walk down a tree trunk, searching for bugs in the rough bark. And they move erratically. So taking a photo of them is a challenge because: 1) They’re in shade, and 2) They’re also in bright sun. After days of experimenting, I started using spot metering. This produced more consistent proper exposures than evaluative or manual meeting. Each year is preparation for the next one. So I reflect on the achievements, experiences, and lessons that came forward during this year. From that I set intentions for the next year. And lastly, I want to take a better photo than this one. 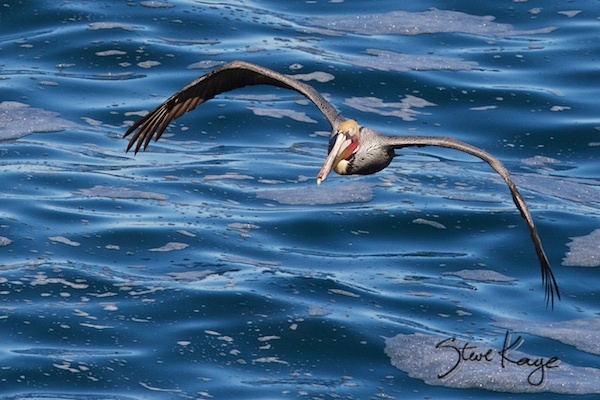 Brown Pelicans plunge dive after fish. That means they drop like a rock, maybe faster. So I need to work on my technique for taking photos of fast moving birds, like plunging pelicans, soaring hawks, and hovering hummingbirds. Find more info by clicking on these links.